Darts is a brilliant sport for a number of reasons; it’s exciting to watch and play, it helps with math, and anyone can play it. As long as you have a dartboard and a set of darts, all you have to do is stand and throw. Sounds simple, right? Today, we’re going to provide all the advice a budding darts player needs when looking for a bristle dartboard and darts. When looking for the best bristle dartboard, it’s important to find a design that suits you including density, inks, wire, and even colors. Two of the best manufacturers include Winmau and Unicorn, these two have been producing boards for the BDO and PDC, the two main darts corporations, for many years. And now we will have a closer look at each of these 5 dart boards. The Winmau Blade 5 dartboard is designed to serve the professional player. It has one of the finest designs that you can find in the market. When you consider the reduced bounce outs, the extensive steel reinforcement at the bull’s eye, you will discover that this product is one of the most impressive things that can be part of your world. Increased Scoring area: It has 14% thinner wiring system which makes it better than the previous generation Winmau blade 4. Also, this unique component gives you higher scoring potential. There are times when you will set goals for your game. It may be as a personal practice objective or as a tournament target; your scores can define the outcome of each gaming experience. You can tick this concern off your list when you settle for this product that can deliver the goods with precision. Reduced bounce outs: The improved dart deflection with the 30-degree reduction in razor wire angle makes you experience reduced bounce outs. Nothing works the magic like understanding the amazing flow that each game can give when you settle for this high-quality dartboard. Triple Wheel Lock and Level System: You can secure the dartboard to any surface with the triple wheel lock and level system. There are some dartboards that need 2 x 4 platform while others work well when they are placed on drywall. This product makes things quite easy because it can operate on any surface. You can decide to take things to the next level by placing it outdoors, or you can make it part of any chosen area of your home. Incredible durability: This product is packed with incredible durability based on the Carbon diffusion technology in bullseye ring for stronger steel reinforcement. Many people have talked about the unique features that come with this dartboard, but the issue of durability is something that makes the product stand tall. It is a dynamic investment that can give you great value in many unique ways. Good for Tournaments: It is not every dartboard that can be used for tournaments. It is full of class, it is made of the highest quality, and it is full of value. When you look at the reviews that have been carried out about this product, you will realize that it is one of the best things that you can find in the market. Increased life of the board. Over 20% solid brand performance. Perfect radial alignment and leveling. The 6mm2 extra scoring area in the trebles. The 9mm2 extra scoring area in the doubles. Not the cheapest dartboard on the market. Not sold in all the countries in the world. 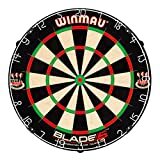 Final Thought: Are you currently wondering where you can find the Winmau blade 5 for sale? Then you are at right place. This powerful product that has enjoyed many rave reviews can be purchased through this channel. It will be one of the best dartboards you have ever purchased in a long while. Quickly place an order for this dynamic dartboard today. 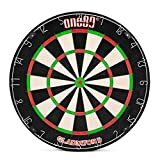 If you want to get a high quality & professional looking 18″ bristle dartboard with all accessories within budget to start great playing taste, so you can buy it without hesitation. FREE flights; FREE kit; FREE finger grip wax; FREE darts. Mounting hardware is also included. Tournament Size: Most of the dartboard organizations recommend 18″ bristle dartboard to play in the tournaments. This Winmax Bristle Dartboard is the ideal size for using in the tournaments or playing at home. That is why when you play for fun or practice at home you will get real tournament feelings. Also, every hitting on it makes paving way easy for you to compete in the tournaments. First Grade Kenyan Sisal: Quality of dartboard is a crucial factor when you want to hit continuously. The Winmax has made this super high-quality dartboard on the thinking for a long time use. The first class Kenyan Sisal material has added the quality of enduring thousand of hittings of it. When you hit steel tip darts on the dartboard they penetrate getting at able and while pulling out the darts the fibers automatically reattach to their original position. That is really a magic of this dartboard. High Tech Staple Free Blade: Reduced bounce outs influence of your hitting impression. Winmax has used much thinner blades that are thinner than wire on this professional level bristle dartboard. The blade wire system delivers more scoring surfaces & reduces bounces out amazingly. Due to that, you can achieve higher scores & make lots of fun with family or friends. Rotatable Ring: You make use of your money with this dartboard if you purchase. The rotatable numbers ring fulfill your desire to hit the numbers as you like most. It makes sure the long-lasting quality of the dartboard surely. Free Accessories: You will commence gaming after buying. Because you don’t need to go anywhere & expense extra money for the other accessories that need to start. You will get 6 steel tip darts, 1 sharpener, free finger grip wax & mounting hardware that create your gaming path simple. 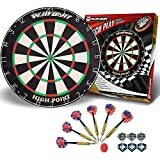 Included darts set are good quality. Darts are not perfect for professionals player. There are many dartboards that have graced the market in recent times, but none of them comes close to One80 Gladiator 2. It has one of the finest Brazilian sisal material as part of its components, and it is highly durable. This is why many users have made very positive reviews about the product. Another high point is that it has a unique aesthetic appeal. Official tournament staple free dartboard: This can be used at taverns, homes or offices. It has a cross-appeal that has endeared it to a wide range of people. When you look at a recently released Gladiator dartboard review, it talks about the size of this product. It meets the benchmark for those who want to play the game professionally, and it serves those who are casual players of the game of darts. Durable: The non-fading color is another factor that has made this product to stand tall. When you search the internet for the gladiator 2 dartboard for sale, you will realize that this feature jumps at you. Everyone wants something of value, and this dartboard gives you full value for each investment you make in one unique swoop. Triangular wiring: The powerful design of the dartboard means that you have less to worry when it comes to bouncing outs and hitting the right target. It is expedient to mention that bounce outs are one of the biggest problems dart players face irrespective of their skills set. The manufacturers of this product ensured that they took care of this concern. You can look at the things that you want in a dartboard and weigh it against what this product offers; you will find that this is top of the pack. Versatile: You can use this board for a soft tip or steel tip darts. This means that you will not run out of ideas whenever you settle with this dartboard. It has been named one of the foremost products that have been launched on the market. It is quite robust in the way it serves a wide range of people. Some have decided to use this as a gift for their loved ones. In whatever capacity you choose to make use of this dartboard, it will give you real value for money. Self-healing property: This is one of the most powerful features that this product has. You do not have to worry about damaging your dartboard as it can heal itself. This product has been tested against steel tip darts, and the result is quite impressive. The board heals with speed and gives each user value for the time and resource invested. Affordable: When weighed against other products in its ilk, you will realize that this is one of the cheapest that you can find in the market. However, you must understand that it is not so much about price but what this product can do. This is why I will recommend this dartboard for anyone who loves to have a good time. Comes with a triangular wiring. Good for all classes of players. Not available for shipping to all countries. Final Thoughts: I have seen many dartboards grace the market over the years, but I am yet to find one as powerful as ONE80. The Brazilian sisal material used in its design is something that you cannot easily find in any other range. It is simply a unique way to raise your game of darts to the next level. Do get yours today! This dartboard serves great functions for the beginners & casual player. Its quality, design, reduced bounce outs & movable ring encourages the playing spirit whether you want to play lonely or with friends. This tournament size 18′ dartboard also allows to customize your drilling and to strengthen the weakest areas. Quality: It is edified with high-grade sisal fibers. For that reason, It is long-lasting in durability. Not only mere that The dartboard has minimum bounce outs. New Classy look: The dartboard is not only focused on the quality but also the design. Its high-resolution diamond markers on the double and triples give the classy to the dartboard. Due to that, you give in laser focus on the segment you want to hit. Razor thin Wire: This beginner bristle dartboard is utilized razor thin galvanized’s wire to increase the surface area for hitting & reduce bounce outs. It makes the way to do high scores & go to the next level of games easily. Moveable Ring: You can move the dartboard’s ring. As a result, the dartboard gets its extending life to exist. Diamond graphics markers very clear to see. Endure a long time of use. Budget price board for beginners & casual. The Unicorn Eclipse Pro Dart Board is a dynamic product that has enjoyed rave reviews across the globe. 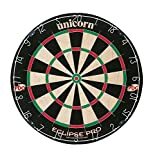 I believe that this unicorn eclipse pro review will enable you to connect with some of the finest features you will love about this sublime dart board. Quality Bristle Board: The Unicorn Eclipse Pro Dart Board is one of the best products that you can find in its range. The manufacturers ensured that they kept tabs with some of the highest global standards for dart board production. This is why this unique unicorn champion dart board has been used for various championships across the globe. High Technology Wiring design: The product ensures that people do not suffer bounce outs when they play the game. I decided to use strong darts in order to ascertain the validity of the use of this wiring design. I must attest that it surpasses what you will find with other conventional dart boards in the market. It is simply full of class, and everything about the product spells excellence. Staple-free Bullseye: The unicorn eclipse pro bristle dartboard is simply iconic. The staple-free Bullseye design takes it into a completely new league. I discovered that the staple free make-up ensured that I not only hit the right mark, but it also helped me decide to take the game of darts more seriously. Free Checkout Chart: You do not need to get worked up about having the best game experience. The free checkout chart is sublime and helps to take things to a whole new level. It is not just about the essence of the game and what it can do to the dart player; it helps to bring the right form of excitement when you engage with your loved ones in a friendly duel. For those who choose to take things on a professional level, you can keep tabs on your game by continually living up to the bill with the help of the free checkout chart. Dynamic design: The Unicorn eclipse pro dartboard and cabinet is full of value-adding experiences. I discovered that it was easy to store the product after each game and I had taken it on a few family vacations. I recommended this board to a few of my friends, and each one has shared how they are impressed with the offering of the product. It is fine, trendy and touches base in the heart of those who want to fully engage with the game of darts. Top line Construction: The completely stable-free construction is something that I love about this product. I decided to share this with some of my friends, and they told me that it is one of the features that have endeared them to this dartboard. I looked at the frame and decided to test the product against some of the toughest elements. I must confess that I was a bit skeptical when I wanted to know how solid the construction was. However, I must attest to the fact that the product surpassed my expectations. It is one of the best value-adding products that you can find in the market. 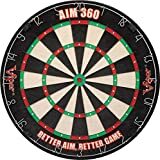 Affordable: I love this dartboard because it does not cost so much when you weigh it against the value that it provides. It is ideal for those who want to make it part of their unique collections or those who want to share it as a gift to their loved ones. I believe that those who are on a budget will find the dartboard as the ideal pick for them. Easy to store the dart board. Portable and good for home use. ideal for use at championships. Comes with Free Checkout Chart. Ideal as a gift for your loved ones. Affordable and it is highly durable. Comes with a compact and trendy dart board. Use of high-level technology in its fabrication. Not ideal for children below 6 years. Not the cheapest dart board in the market. Final Thoughts: I am quick to endorse this dartboard because it has proven to be one of the best products that you can find in the market. I played with this board, and I can attest to its beauty, top line finishing and perfect design. It is the ideal pick for those who truly want to take their game of darts to the next level. You can enter a new league by placing an order for this dartboard today.